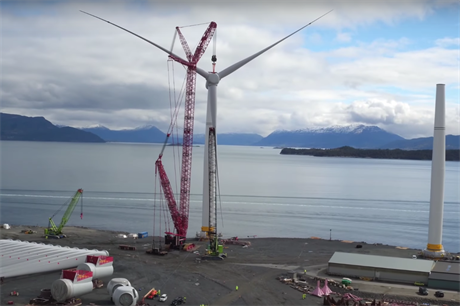 Statoil has released a video of the first rotor being lifted in to position at the harbour site in Stord, Norway. The overall structure could be 258-metres long – from spar-base to maximum blade tip height. Statoil is partnering with United Arab Emirates-based renewable energy firm Masdar on the project, set for a site 25km off Scotland's northeast coast. It will become the world's first commercial floating wind project. Five Siemens 6MW turbines will be installed over the year, with first power expected by the end of 2017, Statoil said. Norwegian developer Statoil gave the final investment decision on the project in November 2015, after receiving the final consents from the Scottish government. The developer said the spar-buoy foundations have been constructed in Spain and will be delivered to a shipyard in Norway for assembly before making their way to Scotland in the summer.